This orange organism growing the surfaces of fallen leaves in the woods has stumped me for years. 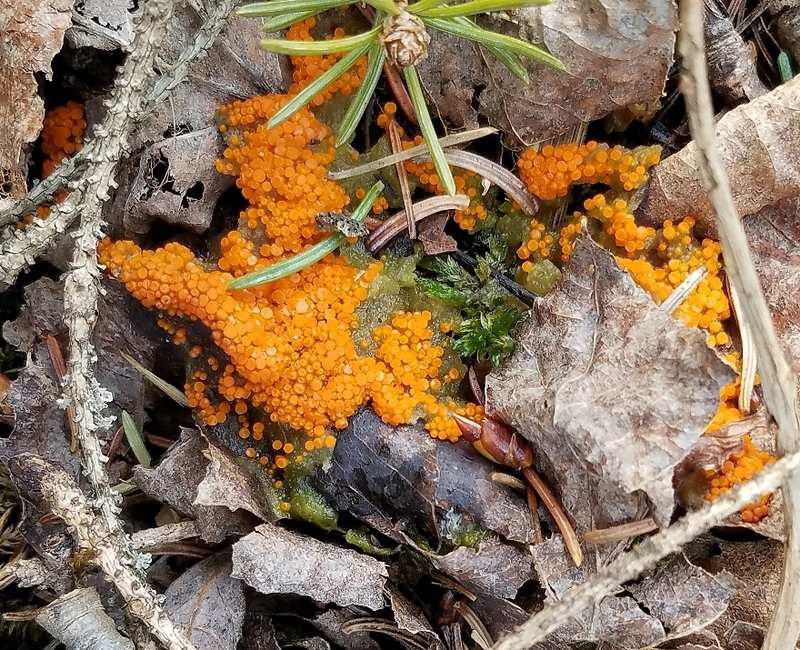 I had long thought it was some sort of slime mold (Myxomycota) and every spring when I saw the little orange patches it forms on dead leaves and deer dung in the forest I would go searching websites to find out what this strange slime mold was. I never did figure it out until today when I looked very carefully at the cup-like structures and thought that maybe this is no slime mold but a fungus in Ascomycota (cup fungi). Within a few minutes I came across several photos of an orange fungus that looked very similar to this one. Not only that but I solved another new mystery which was the white fungus with brown cups growing with the orange one. The answer to both mysteries was found at Sociedad MicológicaI Extremeña. Bysonectria terrestris at Sociedad MicológicaI Extremeña. Pfister, D. H. (1993). A Synopsis of the North American Species of Byssonectria (Pezizales) with Comments on the Ontogeny of the Two Species. Mycologia, 85(6): 952-962. Seaver, F. J. (1951). The North American Cup-fungi (Inoperculates). Published by the author.